Farrar, Straus and Giroux, 9780374526177, 144pp. The Poet Laureate's clear and entertaining account of how poetry works. "Poetry is a vocal, which is to say a bodily, art," Robert Pinsky declares in The Sounds of Poetry. "The medium of poetry is the human body: the column of air inside the chest, shaped into signifying sounds in the larynx and the mouth. In this sense, poetry is as physical or bodily an art as dancing." 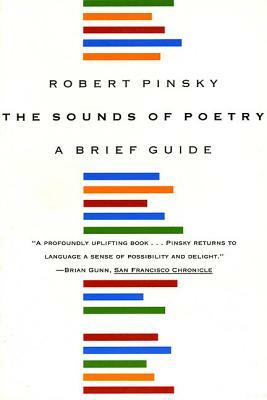 As Poet Laureate, Pinsky is one of America's best spokesmen for poetry. In this fascinating book, he explains how poets use the "technology" of poetry--its sounds--to create works of art that are "performed" in us when we read them aloud. He devotes brief, informative chapters to accent and duration, syntax and line, like and unlike sounds, blank and free verse. He cites examples from the work of fifty different poets--from Shakespeare, Donne, and Herbert to W. C. Williams, Frost, Elizabeth Bishop, C. K. Williams, Louise Glück, and Frank Bidart. This ideal introductory volume belongs in the library of every poet and student of poetry.